The deadline for applications to the ESSE Collaborative Project Workshop Scheme has been extended to 20 April 2018! The ESSE Collaborative Project Workshop Scheme offers seed funding of up to 4,000 Euro to support a preliminary meeting of European researchers working towards a collaborative research project in the field of English Studies. The main purpose of this grant is to encourage prospective co-researchers from different national associations to plan a bid for a larger award from alternative funding sources; it also aims to resource the time and space to work out practical and intellectual details of the proposed project. Applications will be assessed on the quality and originality of research, evidence of sustainable international collaboration, and the feasibility of the project and its development. Grants will be made only to members of ESSE, or to PhD students whose supervisors are members of ESSE. The application deadline is 1 May 2018. Applications will be dealt with as quickly as possible. Books included in the application must be bought at the personal expense of the applicant between the application deadline and 30 June 2018. Grant money will be transferred to recipients’ accounts before 15 July 2018. Applications should be sent to the Chair of the Bursaries Committee using the form attached. The ESSE Nominations Committee seeks nominations for the positions of President of ESSE, which falls vacant in January 2019 and Editor of The ESSE Messenger which also falls vacant in January 2019. Details in the documents below. The application deadline is 1 October 2017. Applications will be dealt with as quickly as possible. Books included in the application must be bought at the personal expense of the applicant between the application deadline and 30 November 2017. Grant money will be transferred to recipients’ accounts before 15 December 2017. Applications should be sent to the Chair of the Bursaries Committee using the form available here. As a result of the ESSE Board decision adopted in Thessaloniki, 2017, all the issues of the ESSE Messenger are now open access – these issues are free to download as no password is necessary to open them. Dr. Titela Vilceanu, University of Craiova (Romania) – President of RSEAS (the Romanian Society for English and American Studies) and national representative for Romania. Professor Terry Walker, Mid-Sweden University, Sundsvall (Sweden) – President of SWESSE (The Swedish Society for the Study of English) and national representative for Sweden. In 2017, like every year, ESSE offered funding of up to €19,000 to help cover costs associated with a research trip. The list of successful applicants for 2017 is now available on the ESSE website (follow Research and Support / Bursaries). The rules for 2018 will be available in September after the next Board meeting. The rules for 2017 have been left available for information. The ESSE Collaborative Project Workshop Scheme offers seed funding of up to 4000 Euro to support a preliminary meeting of European researchers working towards a collaborative research project in the field of English Studies. The main purpose of this grant is to encourage prospective co-researchers from different national associations to plan a bid for a larger award from alternative funding sources; it also aims to resource the time and space to work out practical and intellectual details of the proposed project. Applications will be assessed on the quality and originality of research, evidence of sustainable international collaboration, and the feasibility of the project and its development. The best place for news and info about your association, notes about current academic life and events, conference reports, book announcements or in memoriam articles is The ESSE Messenger Blog. Just send your material to esse.messenger@outlook.com. The Gender Studies Network has now its own page in the ESSE website at: http://essenglish.org/gender-studies/ . The Symposium gives more concrete and recognizable form to the biennial ESSE Doctoral Sessions that were organized as part of the ESSE Conferences in Istanbul (2012), Košice (2014) and Galway (2016). The Symposium is designed to provide a platform for young scholars to present their work, specifically for PhD students who are writing their theses in English Studies and are at least in the second year of their doctoral studies at the time of the Symposium in question. They are invited to make a brief presentation of their work in progress in one of three areas, known as strands: English Language & Linguistics, Literatures in English, and Cultural & Area Studies. 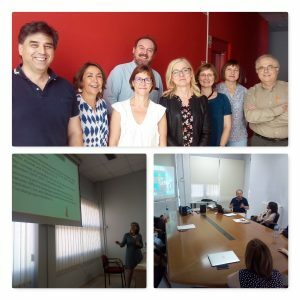 These presentations should deal with the issues addressed or hypotheses tested in the doctoral research, the results so far obtained, and above all the methodology applied, with the purpose of gaining feedback from peers and established scholars in the field. Each presentation will last no longer than 15 minutes, followed by 15 minutes’ discussion. Participants are expected to attend all the presentations in their own strand and to take part in the discussions. There will also be extensive opportunities for informal contact with other participants and with the academics present. Note that each PhD student can submit an application to only one strand of the ESSE Symposium and should specify in the application which strand they wish to be placed in. Applications must include a letter from the student’s PhD supervisor giving the (working) title of the dissertation and confirming that the student is working under his/her supervision and has completed at least his/her first year of PhD studies. The results obtained so far. Each strand of the Symposium will be coordinated by two experts (to be known as Convenors). One will be chosen from the ESSE Board, while the other will come from the host university (in 2017, the Aristotle University of Thessaloniki). They will make a selection from the applications received, respond to the presentations and chair the discussions. Applications (also including the letter from the applicant’s supervisor) should be sent, no later than 28 February 2017, to the Coordinator of the ESSE Doctoral Symposium, Professor J. Lachlan Mackenzie (VU University Amsterdam, Netherlands) at lachlan_mackenzie@hotmail.com. The selection of submissions by the Convenors will be completed and announced by 15 March 2017. Those applicants who have been selected for participation can apply to ESSE between 15 and 31 March 2017 for financial support, to a maximum of €500 per applicant. Eligible expenses are airfares, ground transportation costs and accommodation. Applicants for financial support are required to be members of their national associations affiliated to ESSE, except for those whose associations do not consider PhD students eligible as members; in this case, their supervisors or the department to which they are affiliated must be ESSE members. Applications for financial support will be considered during April by a Committee consisting of the Coordinator of the ESSE Doctoral Symposium and the three Convenors from the ESSE Board; the Committee’s definitive decision will be communicated to all applicants by 30 April 2017.
a signed statement from the applicant’s supervisor, including a declaration that it is impossible for the applicant to draw on private means or any other sources of funding, including funding earmarked for the ongoing doctoral project, for the purpose of participating in the ESSE Doctoral Symposium. Please note that ESSE’s decisions about selection for participation and about financial support are final and not subject to appeal. Further details of the programme of the Symposium will be made known as and when these are determined. Among the possibilities being considered are a welcome from the President of ESSE, Prof. Liliane Louvel, a reception for all participants, a plenary lecture on a relevant subject and an excursion to the city of Thessaloniki. The possibility is being examined of including a selection of papers arising from the ESSE Doctoral Symposium in future issues of the ESSE Messenger. Thessaloniki is served by Makedonia International Airport (code: SKG). Buses and trains are available from Athens. Long-distance buses are available from starting points in Albania, Bulgaria, Czech Republic, Germany, Hungary, Romania, Serbia, Slovakia and Turkey. Information about accommodation in Thessaloniki will be forthcoming in later versions of this announcement. General enquiries should be addressed to the Coordinator of the ESSE Doctoral Symposium, Professor J. Lachlan Mackenzie (VU University Amsterdam, Netherlands) at lachlan_mackenzie@hotmail.com. The deadline for the submission of applications for the ESSE Book Grants 2016 has been extended to 23 October 2016. For more information please visit http://essenglish.org/book-grants/. In 2017, ESSE will offer funding of up to €19,000 to help cover costs associated with research trips. The rules to apply for the 2017 ESSE Bursaries are now available on the ESSE website at http://essenglish.org/bursary-rules/.